Introduction: What were the Einsatzgruppen? The Einsatzgruppen (Special Groups) were four mobile paramilitary units who were assigned to follow the Wehrmacht (regular Germany army) into the Soviet Union and its territories after the German invasion of the Soviet Union on June 21, 1941. They were tasked with executing Communist Party officials, Jews, and partisans. Many of the early victims of the Einsatzgruppen were Jewish males, since the Germans believed that Communism was a Jewish phenomenon. According to this logic, all Jewish males were Communist operatives. Within a few weeks, probably on verbal orders from Berlin, shootings started including Jewish women and children. How were the Einsatzgruppen organized? There were four major Einsatzgruppen units: A, B, C, and D. Truck drivers, radio operators, administrators, interpreters, and other personnel supported the active members of each Einsatzgruppe. Each Einsatzgruppe was further divided into sub-units units, known as either Einsatzkommandos or Sonderkommandos. If required, these units could be broken up into yet smaller units in the field (Teilkommandos). Einsatzgruppe A was attached to Army Group North and contained 990 men. It was assigned to the Baltic area (Lithuania, Latvia, and Estonia). The commander was Dr. Franz Walter Stahlecker; later, Heinz Jost became commander. This unit was organized into two Sonderkommandos (1a and 1b) and two Einsatzkommandos (2 and 3). Einsatzgruppe B was attached to Army Group Center and contained 665 men. It was assigned to the Belarus area. The commander was Arthur Nebe; later, Erich Naumann became commander. This unit was organized into three Sonderkommandos (7a, 7b and 7c) and two Einsatzkommandos (8 and 9). Einsatzgruppe B also had a special unit called Vorkommando Moskau, initially commanded by Franz Six and later by Waldemar Klingelhöfer. Einsatzgruppe C was attached to Army Group South and contained 700 men. It was assigned to north and central Ukraine. The commander was Dr. Otto Rasch; later, Max Thomas became commander. This unit was organized into four Einsatzkommandos (4a, 4b, 5, and 6). Einsatzgruppe D was attached to the 119th Army and contained between 400 and 500 men. It was assigned to Moldova, south Ukraine, Crimea, and the North Caucasus (during 1942). The commander was Otto Ohlendorf; later, Walther Bierkamp became commander. This unit had five Einsatzkommandos (10a, 10b, 11a, 11b, and 12). Three Higher SS Police Leaders (HSSPL) were in charge of large portions of the occupied Soviet territories. They were Hans Prutzmann, Erich von dem Bach-Zelewski, and Friedrich Jecklen. They reported to Himmler and they coordinated the activities of the Einsatzgruppen in their assigned region. They were not the direct bosses of the Einsatzgruppen, but they could draw on them for help in their assigned area. All four Einsatzgruppen made extensive use of local populations in order to most effectively carry out mass murder. In the first days of the war on the Eastern Front, they incited local populations in Lithuania, Latvia, Ukraine, and Belarus to conduct over 60 brutal pogroms. They murdered at least 10,000 Jews (and possibly as many as 24,000). When the “spontaneous” urge to “self cleanse” came to an end (i.e., murdering local Jews in pogroms), the Einsatzgruppen organized hundreds of thousands of local volunteers into formal units. These units acted as “willing executioners” and assisted the Nazis. Local volunteers also actively conducted executions under the Einsatzgruppen’s supervision. Furthermore, the Higher SS Police Leaders (HSSPL) had units of German policemen under their direct control, who executed Jews at their command. These police battalions were available to assist the Einsatzgruppen as well. The Wehrmacht (regular German army) was also involved in the direct murder of some Jews. Arthur Nebe. Bundesarchiv, Bild 101III-Alber-096-34 / Alber, Kurt / CC-BY-SA 3.0, via Wikimedia Commons. How many Jews did the Einsatzgruppen murder? Although an exact figure will never be known, according to their own records the Einsatzgruppen murdered at least 1,150,000 people. Not all—but most—were Jews. Most victims were shot, but some were murdered in gas vans and pogroms. The Einsatzgruppen instigated most pogroms, despite the fact that primarily locals conducted them. It is important to understand that the Einsatzgruppen were not directly responsible for all murder in the East. This fact increases the total number of Jews killed from the recorded number of 1,150,000. Aside from direct execution, many Jews died from ghettoization, disease, and death by overwork or privation. Ultimately, the total number of Jews who were murdered in the East is closer to 2,500,000. The Einsatzgruppen were just one part of a widespread and effective killing machine wielded by the Nazis. However, the Einsatzgruppen and their collaborators were responsible for about one-third to one-half of the number of murdered Jews. 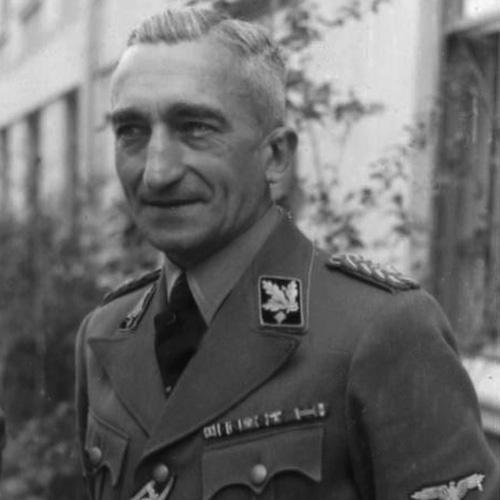 After Heydrich’s death in 1942, Ernst Kaltenbrunner took over his duties, including supervising the four Einsatzgruppen. For a thorough discussion of the forces available to murder Jews in the East and their organization see Raul Hilberg, The Destruction of the European Jews, Volume 1 (Holmes & Meier, 1985), pp. 273-290 and Yitzhak Arad, The Holocaust in the Soviet Union (University of Nebraska Press and Yad Vashem, 2009), pp. 51-62. Peter Longerich, Holocaust: The Nazi Persecution and Murder of the Jews (Oxford University Press, 2010), p. 195. Peter Longerich, Holocaust: The Nazi Persecution and Murder of the Jews (Oxford University Press, 2010), p. 239. Peter Longerich, Holocaust: The Nazi Persecution and Murder of the Jews (Oxford University Press, 2010), pp. 239, 240.